Both convergent and divergent thinking are vital in our lives. Neither one is exactly more superior as compared to the other. For us to do well in various tasks, we often need to use these opposite mental processes in conjunction. When faced with a problem, we need to explore differing options (divergence). Afterwards, we narrow down our choices and decide on the “best” solution (convergence). For instance, John Kennedy used convergent thinking to figure out that America could beat Russia into space by sending a man on the moon and NASA team employed divergent thinking in developing the equipment and lunar modules. Divergent thinking talks about considering several solutions to a certain problem. It is sometimes referred to as “lateral thinking” which is a term credited to Edward De Bono, a Maltese psychologist, physician, author, and inventor. As one of the leading authorities in creativity, he proposed that problems should be solved through indirect and creative strategies. This mindset is best utilized in inventive tasks such as free writing, creative artwork, mind mapping, and brainstorming. Ideas are generated in a highly spontaneous manner. Although an answer has been found, the possibility of finding other answers is still considered. Concepts are multilayered and involve numerous standpoints. Joy Paul Guilford, an American psychologist, coined the term “convergent thinking”. It refers to figuring out a certain established solution to a problem. This is often employed in structured assessments such as multiple-choice items, identification, and arithmetic problems. As compared to divergent thinking, convergent thinking focuses more on speed as it aims to verify the most direct and efficient answer in a shorter period of time. An accurate answer is derived after the process. This means that a certain concept may either be right or wrong. A linear method is used and rational steps are taken to figure out the correct solution. Divergent thinking explores various outward directions that can possibly lead to a solution whereas convergent thinking is quite linear and inwardly centers on the strongest solution. 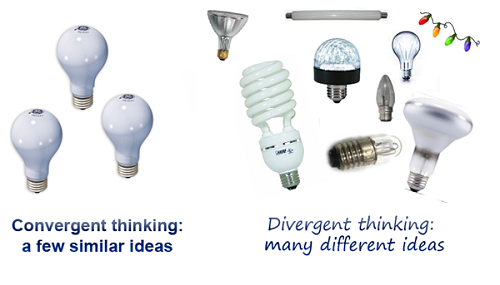 Divergence focuses on unique ideas or original products while convergence considers the utilization of previous techniques. Convergent thinking seeks to find out the definite answer. On the other hand, divergent thinking views possible answers as limitless. Convergent thinking sees fixed sides; something is either black or white. However, divergent thinking views concepts less rigidly; it considers the gray areas and less certain perspectives of the solutions. Convergent thinking is most effective in decision making tasks while divergent thinking is needed in figuring out probable options. Studies show that individuals who are open to new experiences and extroverted often employ divergent thinking. This implies that those who are more comfortable with what is familiar as well as those who are introverted usually practice convergent thinking. Interestingly, research correlated divergent thinking with positive emotional states where as convergent thinking was associated with negative moods. You are more likely to generate various ideas when in a pleasant mood as you become less critical and appreciate differing viewpoints. In divergent thinking, the multiple answers are of equal value. On the contrary, convergent thinking dictates that there must be a certain answer with the highest value. Divergent thinking favors intricate ideas while convergent thinking encourages strong and clear-cut concepts. Divergent thinkers take more risks with their adventuresome ideas as they often like to experiment and go against the flow. On the other hand, convergent thinkers tend to be on the safer side by mainly considering tried and tested options. As compared to their convergent counterparts, divergent thinkers tend to be more curious as they have a number of questions and contemplate on wide-ranging as well as in depth ideas. Since divergent thinking is mostly associated with artistry, it mainly stimulates the right hemisphere of the brain. As for convergent thinking, it is generally related with logic which is generally processed in the left hemisphere. Deductive reasoning is followed in convergent thinking as a logical answer is derived by eliminating the other less reliable data. Conversely, divergent thinking leans towards inductive reasoning as ideas stem out from a main proposition. Divergent thinking favors quantity over quality in the sense that its chief aim is to produce as many ideas as possible. Contrarywise, convergent thinking supports quality over quantity as it purports to determine the finest idea. As divergent thinking welcomes all potentials, the process often endures for long periods of time. Antithetically, convergent thinking concludes earlier as it only considers what is perceived as highly relevant. Both divergent and convergent thinking are essential in problem solving. Divergent thinking leaves room for ambiguity while convergent thinking strongly focuses on the exact answer. As compared to convergent thinkers, divergent thinkers tend to have better moods. 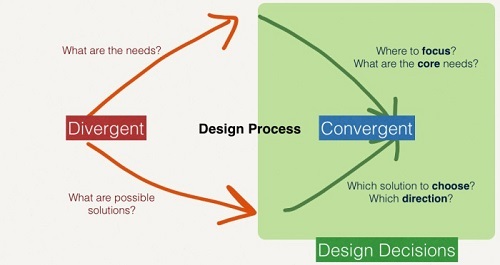 Divergence considers a number of ideas whereas convergence seeks the best idea. Thus, quantity vs quality. Divergent thinking involves artistry which is associated with the right brain while convergent thinking encompasses logical reasoning which employs the left brain. Divergent thinking is a longer process as compared to convergent thinking. gene balinggan. "Difference between Divergent Thinking and Convergent Thinking." DifferenceBetween.net. December 21, 2017 < http://www.differencebetween.net/science/psychology/difference-between-divergent-thinking-and-convergent-thinking/ >. Your use of Quality/Quantity isn’t clear here. It may hold true as you’ve written it, to some extent. To me, Divergence seeks the highest Quality, by seeking and sorting through many answers, although it is time-consuming. Convergence, however, is in a hurry, and only cares about the answer that gives the best Quantity resolution that can be guaranteed in a limited time-frame. In other words, I think the Quantity/Quality description is ambiguous, at best. It transcends the “2-sided” issue – both a Divergent thinker and a Convergent thinker may be seeking the highest quality. I think that varied circumstances make the differences. Chamorro-Premuzic, Tomas. "Effects of Personality and Threat of Evaluation on Divergent and Convergent Thinking". Journal of Research in Personality 42.4 (2008): 1095-1101. Print. Nielsen, Dorte. The Secret of the Highly Creative Thinker: How to Make Connections Others Don’t. Amsterdam: BIS Publishers, 2016. Print. Yamada, Yohei, and Nagai, Masayoshi. “Positive Mood Enhances Divergent but Not Convergent Thinking”. Japanese Psychological Research. 57.4 (2015): 281-287. Print.